Il mio amore naviga nelle acque della Martinica, Santa Lucia, Grenadine, Grenada. My Love è un catamarano da 40 '. Avrete lo scafo di tribordo privato con il suo letto queen size e il bagno privato. Il prezzo include tutti i pasti, bevande analcoliche e alcoliche, permessi di crociera, ormeggi e carburante, pulizia. Forniamo attrezzatura per lo snorkeling, attrezzatura da pesca, kayak, giochi d'acqua, sacchi di fagioli. Rilassati sul barbone con un aperitivo serale. I spent 12 days in January on S/V My Love with Faye and Mike. It was one of the most relaxing and enjoyable vacations I have experienced. Whether snorkelling, hiking, exploring the various villages along the sailing route or just lazing on the deck, each day provided something new. Mike and Faye are excellent hosts and open to suggestions. 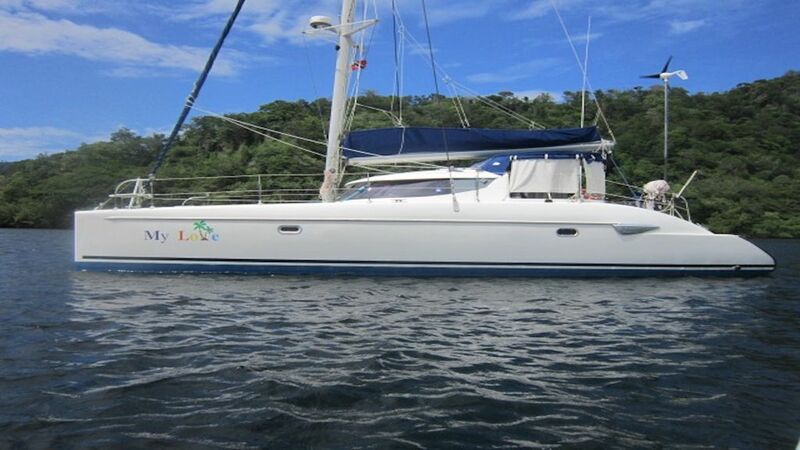 S/V My Love is spacious, comfortable and clean and the food is prepared with everyone’s needs and interests considered…and they let you participate with your culinary skills if you desire! Memorable vacation and would love to tour with S/V My Love again. We are thrilled you had a relaxing and interesting time while aboard My Love. It was a great pleasure to snorkel and hike with you. We hope to possibly see you again in the future. Maybe try out kite boarding? We have had the pleasure of sailing with My Love twice, and have had many wonderful adventures. on a crowded cruise ship. Thanks to our hosts we have caught Tuna and Mahi-Mahi, hiked, kayaked, and interacted with locals as well as other cruisers. We have snorkeled, walked on hidden beaches and swam with turtles. We have had many great meals and great memories. Thanks MY Love. We hope to be back again. It was a pleasure to have you aboard My Love. We also enjoyed the Tuna and Mahi Mahi you caught. They made great meals! We hope to have you aboard again.